Allow me to share with you what has become a very special and personal part of my life. For many years now I have enjoyed my early morning time of Bible reading. It begins in the wee hours of the morning, usually around 4:30 or 5:00 am, with a pot of my favourite coffee, and them curling up in my favourite chair. The odd time that my ritual is missed, usually seems to create a disjointed day for me. I have come to rely on that quiet time and cannot imagine starting my day without it. Daily Bible reading was simplified for me when, years ago, I discovered The One Year Bible. This is a system that divides the Bible into 365 daily readings. Each day you read through a portion of the Old Testament, the New Testament, some Psalms, and some Proverbs. 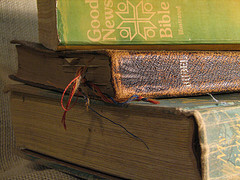 For years I had two different versions, the NIV and the paraphrased Living Bible. I would alternate versions from one year to the next. Then, when the ESV became available in that format, I added it to the rotation as well. This year I am trying something a little different again. I received "The One Year Chronological Bible" as a Christmas gift. So far it is proving to also be an enjoyable experience, and it has also exposed me to yet another translation that I was formerly unfamiliar with; the NLT. "Now you can gain a better understanding of the order of biblical events and the historical context in which they unfolded. The One Year Chronological Bible arranges the Bible text in the order the events actually happened. In The One Year Chronological Bible, prophetic books are interwoven with the historical accounts they accompanied. Psalms follow the events about which they were written. Proverbs are placed in the time frame in which they were complied. The life of Christ is woven into one moving story. And Paul's letters to the young churches in the first century are integrated into the book of Acts." It truly does give Bible reading a new perspective. I will have to remember to revisit this post at year's end to share any other insights from this experience. The eBook enthusiast might want to consider one of the Kindle versions. For those who prefer to do their reading online, there is of course an online version as well. Not having tried either of these electronic versions yet, I cannot comment on them. However, I imagine they're quite good as well. So if you are looking for a way to discipline yourself into daily reading a portion of the Bible, I would strongly recommend The One Year Bible.